Take a seat and settle in. For the last 14 months, the front room at Electra House Hotel (on the left through the hallway entrance) has sat empty, awaiting a concept befitting of the high-calibre hospitality venue. Formerly the pokie room, the 20 machines that lined the space were removed in November 2017, and the team is now set to launch The Post Masters Quarters, or PMQ, in early February. Electra House will officially launch PMQ on Saturday, 2 February during CBD & Vines. Keep an eye on the venue’s socials for updates. “The gap that we saw was we don’t really have anywhere that’s really comfortable within the building, where you want to settle in and spend a night and be looked after,” general manager Chad Hanson says. Hosted by a dedicated staff member on Friday and Saturday nights, PMQ will feature attentive table service on Fridays, while on Saturdays the room will be open to bookings only with full bottle service provided. The room will also have a specialty drinks menu on offer with “higher end cocktails” not available at the main bar, due to the regular service area’s high traffic on weekends. “Because it’s not a high-volume space, we can offer something slightly nicer,” Chad says. The room will also be freely accessible to patrons for counter service during the day, and on weeknights Tuesday through Thursday, where Chad hopes to capture the surrounding corporate crowd. “The way we’ve designed it is once you sit in that area, it’s quite intimate and removed from everything else. So we hope it becomes a coffee meeting spot during the day,” he says. 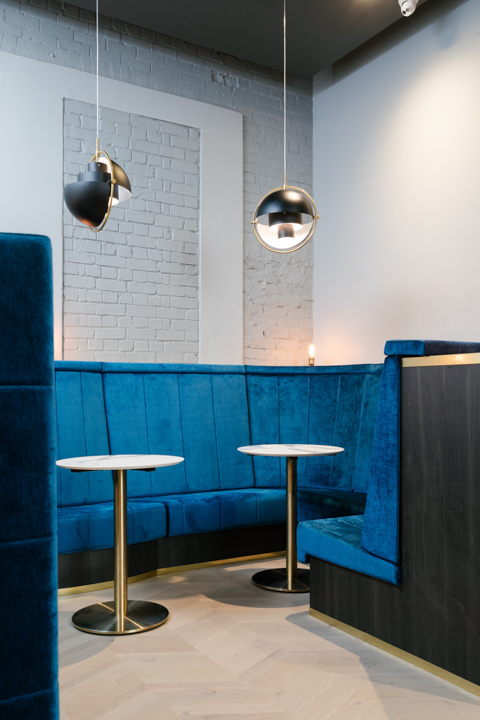 Designed by Dulwich design firm Atelier Bond, the fit out sees the space lined with tall plush royal blue booths, and a mixture of modern and heritage-inspired lighting fixtures, playing on the venues early 20th century history. 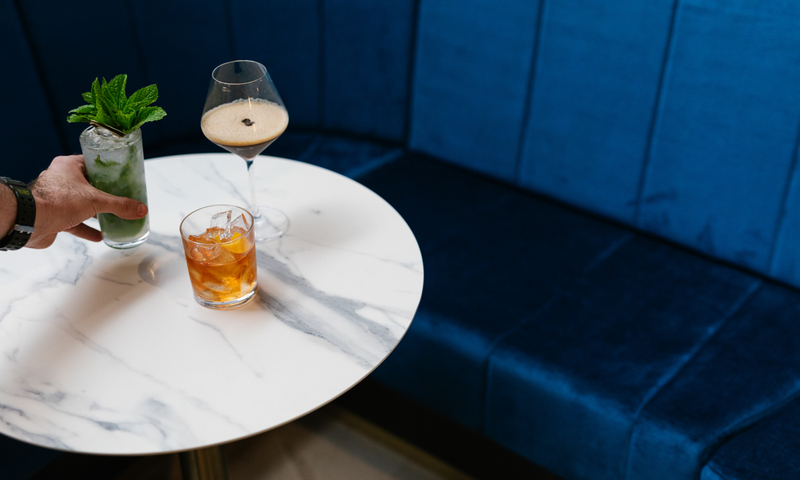 “In 1921, it was the first telephone exchange in Australia connecting international calls in and out on the first floor here, and then after that became the Post Master General’s training school as well,” Level One restaurant manager Kate Rowlands explains. “So this being the Post Masters Quarters, it’s been designed as though it was a working space, a study room, so thus the bookshelves, comfy environment to sit and work and hold meetings,” Chad says. The space will officially launch on Saturday, 2 February during the venue’s CBD & Vines event, where the room will be taken over by The Exchange, Coca-Cola Amatil’s whisky arm. The Exchange’s Erica Richards will host a $45 tasting event at midday on Saturday and Sunday, showcasing rare drams from the group’s collection. The removal of gaming and introduction of PMQ as a premium service space within the larger venue drastically up-scales the room’s utility, and follows the trend of declining pokie machines in the CBD. The machines were also a moral bugbear of staff and diners in the venue, making their removal an easy decision for Electra House’s management to make. “Previously, you’d have customers come through the front door and the first thing they’d see wouldn’t be the venue or the spaces, it would be the pokie room on the left,” Kate says. PMQ is not only a doubling down on Electra House’s commitment to service, but has now extended the stately beauty of the building and its heritage to every corner of the venue.